A new survey [PDF] by researchers at UC Berkeley and published in Access Magazine sheds light on how bike-share systems interact with transit. Researchers Susan Shaheen and Elliot Martin surveyed more than 10,000 bike-share riders in Montreal, Toronto, Minneapolis-Saint Paul, and Washington, DC. Like previous surveys have shown, Shaheen and Martin found that a significant number of bike-share users reduce car use. But their main focus was how bike-share affects transit use. The effect of bike-share on transit travel habits varied according to the context. As you might expect, in areas with sparse transit, bike-share offers an important “last-mile” connection. In areas with dense transit networks, bike-share serves as more of a substitute for transit, relieving crowding on packed buses and trains. People who live in urban cores with well-developed rail systems — like central D.C. — are more likely to substitute bike-share for transit. In these areas, Shaheen and Martin note, bike-share may offer a more direct, quicker alternative to the bus or the train — and that helps open up space on transit lines that need it most. The effect was different in Minneapolis-St. Paul, the region with the least developed transit system and most dispersed development patterns that the authors surveyed. There, 15 percent of bike-share users were more likely to use rail, compared to just 3 percent who were less likely. 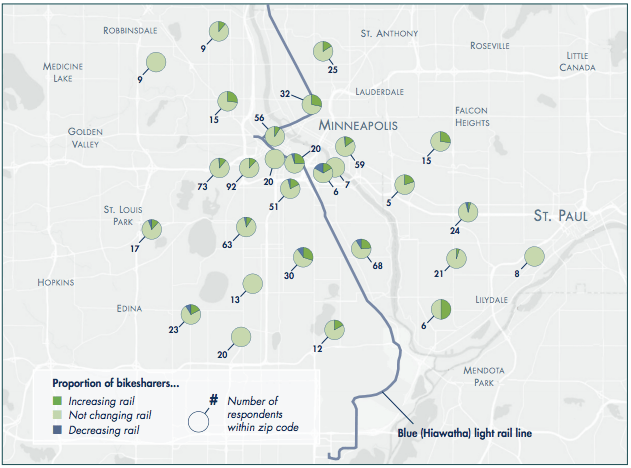 At the time the survey was conducted in 2011, the region had only one light rail line. With a sparse rail network, providing a connection to the train becomes more of a core function for the bike-share system. In smaller cities with less developed transit systems, bike-share is more of a “last mile solution,” the authors concluded. my business partner needed to fill out NY DTF IT-2663 earlier this week and found a document management site that hosts a searchable database . If people require NY DTF IT-2663 as well , here’s a https://goo.gl/pmAj8M. Unlimited 15-minute bike-share trips with the touch of a transit pass? That's the new deal in Pittsburgh.